Keep me informed on the latest Panasonic news. Panasonic is one of the world’s largest manufacturers of components used within Commercial Refrigeration equipment. These components are recognized for superior construction and reliable performance. 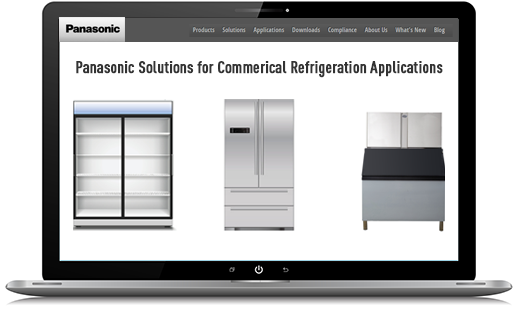 Complete the form to the right to speak with a Panasonic Commercial Refrigeration Solutions expert. Complete the form below to speak with a Commercial Refrigeration Solutions expert. Many products sold by Fortune 500 companies are in fact Powered by Panasonic technology, and we are proud to provide manufacturers with the performance, quality, and reliability that are synonymous with the Panasonic brand. The Power of Panasonic Industrial Devices brings strategic innovations to our customers’ product development process. We provide the technology and engineering resources to enable manufacturers to plan and build world-class solutions to meet their customer needs. Engineering and manufacturing power form the core of our company’s strength, infusing our entire product line, from the smallest chip to giant HD displays. Prior to becoming a global consumer electronics powerhouse, Panasonic began its existence by developing component and material technologies that still serve as the building blocks for the wide range of advanced products for which our company is best known today, and this development continues.